A mordant is a liquid which corrodes metal used in indirect intaglio techniques (etching) to form grooves on the plate. Common substances used include aqueous ferric chloride and aqueous nitric acid solutions. 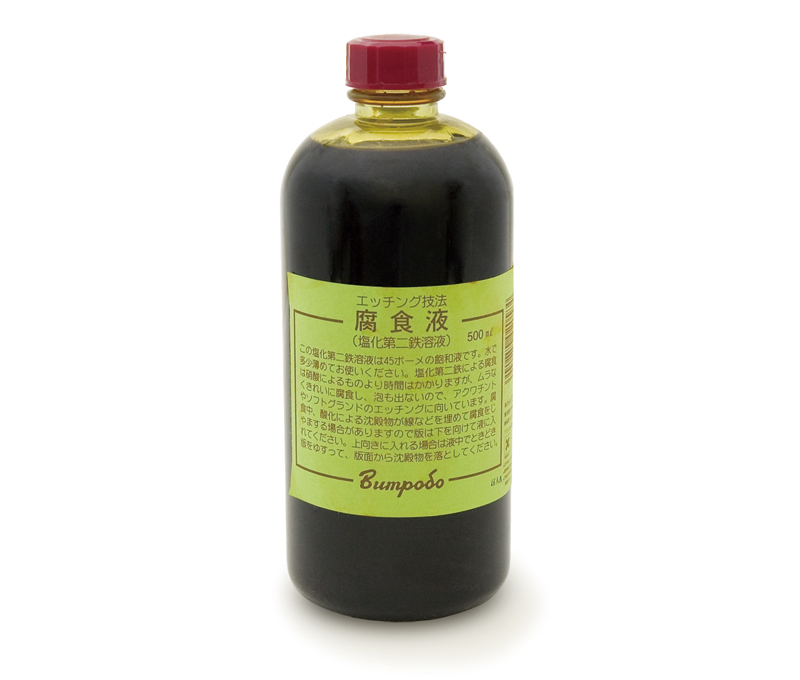 An aqueous ferric chloride solution is a yellow-brown liquid which is used widely as a mordant. When using this solution, small blocks are attached as platforms on the corners of the plate, and the plate is soaked face down in the solution. This is to prevent chemical compounds (etch residue) from forming and accumulating in the grooves, hindering the etching process. By placing the plate face down, the etch residue falls down so that it does not build up in the grooves. 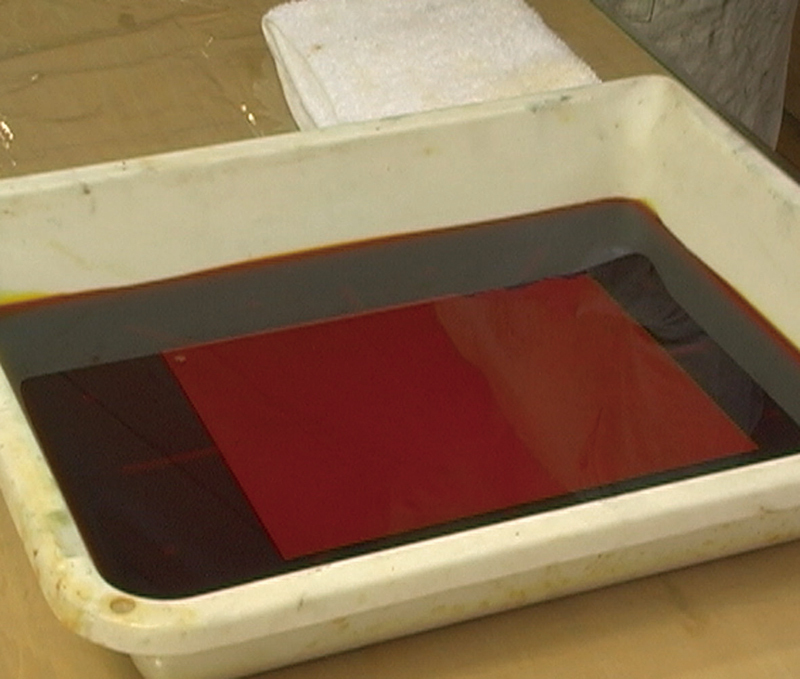 Once the etching is completed, the remaining mordant on the plate is rinsed away with water. The plate can then be neutralized by pouring some soy sauce on it to prevent further oxidation. A feature of aqueous ferric chloride solution is that it produces sharp vertically etched lines. Aqueous nitric acid solution is a typical mordant which has been used for a long time. It is a colorless liquid but turns gradually blue when it is used to etch copper. It is prepared by putting some water in a resin vat and then adding nitric acid solution to produce aqueous dilute nitric acid solution. Adding water and nitric acid in the wrong order will generate heat and is dangerous. 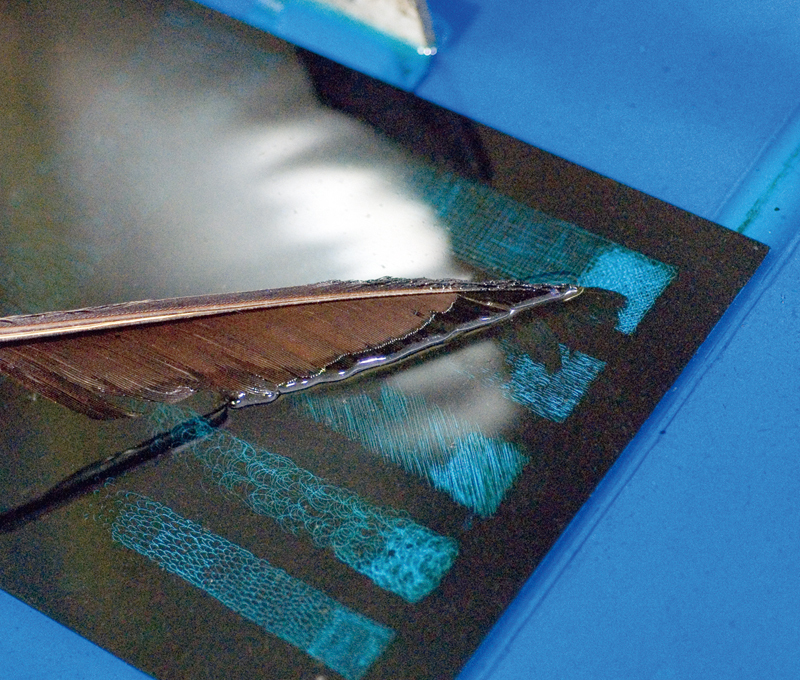 When etching, the plate is soaked with the image facing up. Bubbles generated from the grooves being etched will hinder the etching process so these should be removed by stroking the plate surface gently with feathers or a soft cloth. Aqueous nitric acid solution tends to etch the lines vertically and also gouges them laterally at the same time. Beside these, there is also the Dutch mordant which is made of hydrochloric acid. Mordants should be handled with care as they are harmful to the human body and can have an impact on the environment. When using either type of mordant, they should be placed in a resin vat, making sure that only one type of metal is used with each solution. Rubber gloves should be worn so that the skin does not come into direct contact with the liquid. When using aqueous nitric acid solution in particular, make sure that the room is ventilated and that gas masks are worn because it produces toxic gas. When disposing of the mordant, it should either be disposed of after neutralizing with hydrated lime or ammonia, or be entrusted to a waste disposal operator. Aqueous ferric chloride solution can be purchased at art supply stores that handle printing supplies and pharmacies, and nitric acid solution can be obtained at pharmacies.